Anyone looking for tips on what to wear to Mardi Gras in New Orleans should listen up! As a life-long Mardi Gras parade goer, I've learned a thing or two about choosing the perfect Mardi Gras outfit! You MUST dress for success at the biggest event in Louisiana, but couture clothing isn't required. 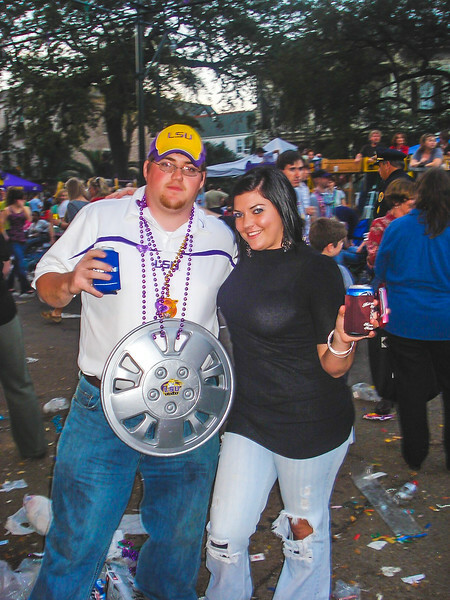 Use these practical style tips to stay comfortable and dry while waiting for the passing Mardi Gras parades. Pssst... are you looking for Mardi Gras tips!? What makes me qualified to write about Mardi Gras fashion? If you've ever explored my website, then you probably know I don't typically write about fashion. But when I do, I usually talk about comfortable travel clothing and classic style that's practical and affordable. I'm not a model, and I don't play one on Instagram or my blog. Luckily, creating a fun Mardi Gras outfit isn't about trends. And I've been to enough Mardi Gras parades to know you don't need couture clothing to have a good time. Over the years, I've learned the importance of what to wear to Mardi Gras, meaning what makes me feel comfortable all day/night long. Take it from me, watching the parade is a lot less fun with blisters on your feet. And staying for the night parades (the best ones in my opinion) is much colder when you're soaked from a mid-day rain. So, trust me if you want to have a fun, dry Mardi Gras free of blisters and frostbite. Use the following tips on what to wear to Mardi Gras for a wicked good time! Just be sure to come back and thank me later in the comments. Here are some general tips on what makes a great Mardi Gras outfit. Use these Mardi Gras tips for creating a custom look that's both stylish and comfortable. Every single suggestion is something I've either tried or experienced personally. I want you to have a GREAT time at Mardi Gras, which means wearing the RIGHT clothing and accessories. Mardi Gras is the one place you could wear just about anything, including a wild & crazy costume. Costumes are part of the tradition, so dig out that wig and feather boa! Bonus points if your costume is Mardi Gras-themed. Purple, gold, and green go a long way to get you noticed during Mardi Gras festivities. And the more you stand out, the more likely you'll be to get good throws from the passing parade floats. Check out a few of my picks from Amazon below! Don't wear anything you care about ruining. Mardi Gras is hectic. There are tons of people, dirt, trash, and lord knows what else. So, as you can imagine, it's easy to ruin your clothes and shoes. The streets of the French Quarter are notoriously dirty, especially during Mardi Gras. Don't risk your new suede boots or your favorite sweater. Grab some purple, green, and gold pieces to celebrate the holiday in style. Go wild with your makeup! Don't limit your Mardi Gras attire just to your clothing. Paint your face with bold makeup choices! But be sure to choose waterproof makeup or have some makeup wipes handy. Sudden (and heavy) downpours are common in Louisiana. As I said before, don't even bother wearing cute shoes. The streets are full of beer, puke, piss, and all sorts of other stuff. Trust me. You WANT to avoid contact with any of these nasty substances. So, be sure to wear closed-toe (preferably water-resistant) shoes. And don't underestimate the importance of comfortable walking shoes. You'll spend most of your time on your feet while going to/from and watching Mardi Gras parades. Feet, you can thank me later! Buy beads and boas online. Believe me! It can be a ton of fun to shop in the French Quarter for festive feather boas, jester hats, and giant beads. But that can get expensive quick! Don't be tempted by the over-priced items in the shop windows. Instead, bring your own Mardi Gras accessories. Shop online at Amazon or at your local party store for affordable accessories to dress up your Mardi Gras outfit. I can't stress this enough. Louisiana weather is unpredictable. Sunny one minute, storming the next is pretty common. You'll want to make sure you're dressed for the weather. That means you need to layer your clothing and bring rain-resistant outwear. If the weather is warm, get a disposable poncho to carry with you just in case. Wet clothing is not what you want to wear to Mardi Gras. be prepared with a poncho! Seriously...don't forget to check out my Mardi Gras guide!? The items below are my very BEST recommendations for what to wear to Mardi Gras in New Orleans. These are the exact pieces I would wear if going to Mardi Gras this year (or any year)! Remember, comfort is key when it comes to your Mardi Gras style. Make sure anything you wear is going to keep you comfy ALL day & night! Keep in mind you'll likely spend the entire day in one outfit, so make sure you're wearing something comfortable. Loose fitting jeans or leggings are perfect for spending the day watching Mardi Gras parades. Depending on the weather, you may want waterproof footwear or a sturdy pair of boots. If the weather is nice, opt for a pair of tennis shoes for maximum comfort. It's important to remember you'll be on your feet most of the day, so choosing good footwear is essential when choosing what to wear to Mardi Gras. As I mentioned in my complete Mardi Gras guide, transportation is tricky during Mardi Gras weekend. Walking is unavoidable. Make sure whatever shoes you choose, you prioritize keeping your feet dry and comfortable. Louisiana weather is CRAY. It's highly likely you'll encounter a few showers no matter when you visit New Orleans. Having a way to escape an unexpected rainfall during Mardi Gras can make or break your party, especially if you're planning to spend the entire day watching parades. Trust me, parades are much less fun if you're cold and wet. Remember, too, that MANY people are going to be looking for shelter from the rain. Why battle strangers for two inches of shelter when you can just wear a cute rain jacket? Like a good cake, layering is essential for Mardi Gras. As I've said already, Louisiana weather can be unpredictable. Mornings and evenings can be quite cool in the winter months, but temps can rise significantly on a warm, sunny day. Being able to add (or subtract) layers is your key to a great Mardi Gras outfit. Do not, and I repeat, do not bring your purse to Mardi Gras. Instead, bring a comfortable (and ideally waterproof) backpack filled with all your Mardi Gras necessities. Wondering what to pack in your Mardi Gras bag? Things to bring in your backpack include chapstick, sunblock, pocket-sized umbrella or disposable poncho, hand sanitizer, disposable sanitary wipes or toilet paper (trust me), a protein-rich snack, camera, cell phone, ID, cash/credit card, and health insurance information (you never know). Mardi Gras is the perfect time to go bananas. You may as well. Everyone else will regardless of whether you do or not. If you aren't interested in crazy green shoes or purple sweaters, then you should consider adding some fun Mardi Gras accessories to fit into the sea of other Mardi Gras goers. You'll want (and need) your cell phone to capture all those fun Mardi Gras selfies. Plus, if you don't have a great New Orleans guide, it's safe to say you'll be using your maps feature to get around. I HIGHLY suggest you invest a few bucks in a dependable portable charger for your smartphone. Don't Miss My Other New Orleans Posts! I went to Mardi Gras for my first time last year and I absolutely loved seeing all the different things people were wearing. I had brought along beads and funky sunglasses – and friends we were with wore some crazy hats – but next time I’d definitely add a wig and a boa. I’d have to agree that the pants you wear are so important – we spent some time sitting on curbs- and some balconies – right on the ground so make sure your pants are comfy and you don’t mind getting them dirty. I’m already scheming to get back next February!